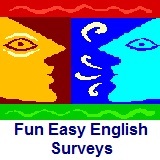 ﻿ Fun Easy English - new classroom free online classes english language lessons speaking listening writing reading january 15. 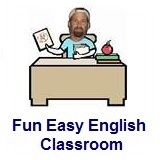 Today in the Fun Easy English classroom you are going to learn many different ways to study English. Pick whatever works for you but remember, practice makes perfect. The more you study the sooner you will improve. Hi. In the classroom today you will learn many good ways to study English. The following list will give you some ideas. Pick the study methods that work best for you. Try tape recording your class or conversations in English. Get involved in English related community or school activities. Listen to English news programs and know current issues. Listen to American television to learn more slang and idioms. Listen to American radio or music to learn more slang and idioms. Watch American movies to learn more slang and idioms. Use a dictionary to look up words you do not understand. Practice English conversation or pronunciation in a mirror. Always think about what you just heard in a conversation. Try to think in English as much as possible. Try to get totally into the language and you will soon notice improvement. Invest as much time as possible towards improving your English. Ask a native speaker to tape-record their conversations. Tell people when you do not understand some of the conversation. Try to learn about the culture of the United States. Join class discussions no matter how intimidated you feel. Interrupt discussions if you do not understand something. Try to talk with Americans as much as possible. Try to learn as many idioms and slang as possible. Don't worry too much about making mistakes. Visit your local library to check out some English books. Subscribe to English books or magazines. Set aside time each night to read English. Form an English study group with your closest friends. Try mimicking intonation, stress, and rate of speech of native speakers. 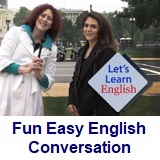 Watch the Fun Easy English Video Lessons as much as possible. Hey I always tell my students if you want to become a perfect English speaker you need to expose yourself to English as much as possible every day. This is easy for students studying English in America or another English speaking country. They can simply go shopping, sit at Starbucks the whole day sipping a Latte, and even make English speaking friends. Doing this exposes them to English continuously throughout the day. This is not as easy for international students trying to learn English in their own countries. Exposure to English is limited and often there are few native English speakers, especially in the countryside. More often their only chance to practice English is in an English conversation class. Is there a solution to this problem? Yup....Fun Easy English. I spent many years putting this site together for anyone interested in learning the English language. Although I provide a lot of useful information and lessons, IT IS UP TO YOU to make the time to study. Follow the study suggestions above. If you cannot find time to study at least listen to English in the background while you are doing housework, cooking and eating meals, and even while you are playing with your kids. Constant exposure to English will make vocabulary, rhythm, and intonation more familiar to you. Survey: What is your favorite way to study English? Everyone has their favorite way to study English. Something that works for one person may not work as well for another person. Conversation Lesson 15 - I Love People-Watching!